Successfully Added LED Projector with DVD Player - 480x240, 10 Lumens, 200:1, Kid Friendly to your Shopping Cart. New LED projector with built-in DVD player that's fun for the whole family. A great portable cinema, this DVD projector lets you watch movies anywhere and without a TV, making it great for camping and traveling! Crisp Clear images: The LED light source delivers a wider color range and deeper color saturation than traditional lamps, which means you get clearer and crisper images. Watch as your movies come to life in big screen splendor! 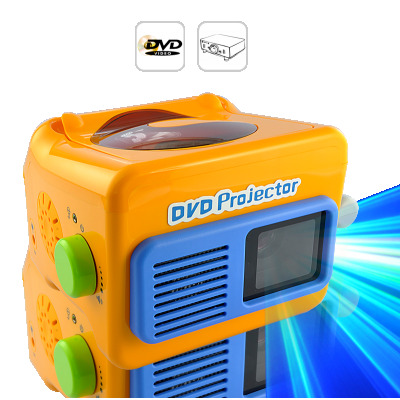 A True Family Experience: This portable DVD projector is so easy to use, even kids can do it - and that's exactly what we want! Little Bobby was told to never touch daddy's expensive projector, but now little Bobby can have one of his own! From turning it on to changing the volume to playing a DVD, operating this unit is as easy and intuitive as can be, which means more involvement and more fun for the whole family! on 2013-01-20 11:19:42 I think I t is as Cool as that S word. I have not even bought it yet, but the Idea is so Cool I think I can do Something with this Product.HHUUMMMMMMM..